You are here: Home » MEDIA » Films » Occupation (2018) (Blu-ray film review). Occupation (2018) (Blu-ray film review). 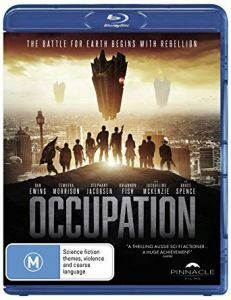 An Australian production, ‘Occupation’ is an SF film of the survivors of an alien invasion of Earth. The humans lost by the way. The first quarter of an hour shows a slice of Australian life and the potential survivors and then it starts. Alien air-based and landed-military force, taking everything in its path. We follow an initial group of ten survivors. They quickly discover that the aliens kept some human prisoners but no way they could rescue them. On their own, they manage to kill two of the aliens and then begin their own form of resistance as other groups. Attrition takes time. They become legendary and even when the military catch up with them, they are regarded as heroes and leaders. For the rest you have to watch. The aliens are revealed to be looking for a planet of their own but took the military way than come in peace. This would explain why they took prisoners than kill everyone. Although I couldn’t identify the particular actors, there’s a varied range of characters. The only thing really missing is anyone with a scientific background. Surely Australia must have some scientists. Having seen Australian films before, I know the ozzies are capable of good stuff and this is one of them. It’s just a shame that there are no extras because I’d have liked to have heard any thoughts that they had on the film. Luke Sparke is both director and writer and, according to the credits, one of the helicopter pilots. Based on what I’ve seen here, I hope we see more of his work. Occupation (2018) (scifi war movie trailer). « Pokemon Detective Pikachu (trailer: live action Pokemon film).